If you’re a gun owner, it’s time to sit down and read. That’s right: The USCCA Concealed Carry Magazine is a must-have for gun owners to properly train and protect yourself. And while it’s not required for reading, their ccw magazine should be required reading for anyone who owns a gun. You want and need to be a responsible gun owner. Around 30% of the population owns a gun, but I can bet that a majority of these owners aren’t shooting often. A lot of owners want to have a gun for home safety, but their guns stay locked away in a safe and are never shot. This means that a person’s shooting skills get rusty. Training. Keep your skills sharp with in-depth training tips and advice. This training will keep you at the cutting-edge of the industry, allowing you to properly use your gun if the time arises. In-depth drills are also provided that allow you to practice shooting. These drills hone the skills you already have, making you a better shot and an overall better, more responsible gun owner. Keep in mind that you’ll receive online access to every issue that has ever been printed, so you’ll have a plethora of training and drills to cover. If you follow the training and drills, you’ll be better able to shoot and defend yourself if the time comes. I shop for guns and gear often. In fact, I might have an addiction. But I never buy anything without scouring the Internet for reviews. I value my money like anyone else. When you crack open your issue, you’ll find that there are reviews for the latest guns and gear. These reviews are from professionals, so you know that you can trust the advice of these reviews. When I am bored, I read reviews on the latest products so that I can keep up on trends. The best part is that not all of the reviews are positive. You’ll get the lowdown on what makes gear good or bad – it’s great for saving your hard-earned cash. You’ll never have to make a purchase blindly again. 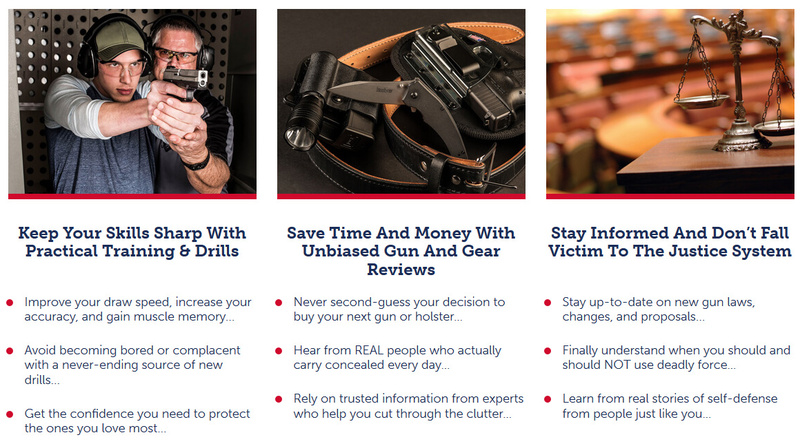 The subscription provides you with the information you need to be a smart gun and gear owner. And I have found that the reviews are far more honest than what I find online. Perhaps because no one is making a commission off of the reviews, they tend to be honest rather than trying to push a sale for a bunk product. When it comes time to protect your home, you’ll be happy that you made informed purchases by reading this magazine. Not much in the world is risk-free, but when you order Concealed Carry Magazine, it’s 100% risk-free. This isn’t your “guarantee” that only lasts a few days at best. No, this is a guarantee that you can take to the bank. Your entire subscription is 100% risk-free. When you sign up, you have the confidence in knowing that there’s a 365-day, 100% money-back guarantee. Say that the magazine doesn’t meet your standards. Well, you have a form of recourse. You can call the customer service department, and they’ll issue your refund promptly. There’s no BS or risk involved. The publisher wants you to be 100% satisfied. But how do they stop everyone from asking for a refund? It’s really simple. The publisher knows that the only way to create content that is worthy of reading and not requesting a refund on is to provide the best experts and writers in the industry. Every issue is written by writers that have real world experience with guns. These aren’t your non-experienced writers that have only come close to a gun at the shooting range. When you subscribe to Concealed Carry Magazine, you’re subscribing to a magazine that vets every writer to ensure that their content is the best in the business. You’ll learn from the professionals and experts that really know what they’re doing. Members will receive their issue every 45 days, and there are eight issues per year. The USCCA App allows you to start reading your issues wherever you go from a smart device. You’ll also have over a decade of content to scour through digitally. That’s right – every issue has been digitized so that you can read all current and past issues. If you’re a gun owner, this is the one magazine that is a must-have.